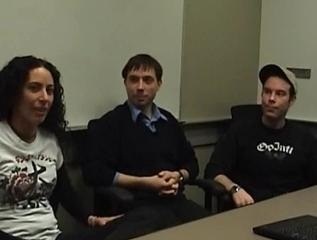 In this interview, Amanda Silver, a Lead Program Manager on the Visual Basic Team, demonstrates new LINQ syntax around Joins and Aggregates that is now available in Visual Studio 2008 Beta 2. Amanda is a guru of LINQ in Visual Basic and gives insightful explanations of how to use this new syntax. Also check out new How Do I videos on LINQ to help get you started with LINQ in Visual Basic. More are added weekly!! The interview starts out a little funny because the first 20 seconds of my video tape got chewed up so we had to reshoot the intro later in the day. Amanda thought of a funny way to make the transition as you'll see. See if you can pinpoint the movie that inspired her! I haven't finished the entire video yet, but I have to say I really dig the new format. More screencast mixing please! I really liked beling able to see the code samples via the ScreenCast. Thanks. Beth's Screencasts are awesome. I'd love to see more screencasts mixed in this way. Very nice experience for the audience. In fact, I do know that more C9 screencasters will be creating a similar style of mixed motion and still video. ﻿I haven't finished the entire video yet, but I have to say I really dig the new format. More screencast mixing please! I better like the charles kinda interview for this kind of stuff. BUT If its got to be a screencast rather than an interview, then this is awesome. Quite high quality on the video compression. Thanks Amanda for this stunning demonstration. Frankly I can't wait to start developing with the new version of VB, although LINQ seems to be drastic change in the language that requires spending more time on it. Amazing stuff! when I think back to the days of say VB6 this would have been thought impossible (almost). And then we saw VS 2003 etc. which was 'amazing' back then. I cannot believe that things have come this far! This functionality will definitely benefit business application developers like myself tons! Thanks again for the vid, these kind are great where you can see the presenters in the small window while the code is rolling! Thanks! I really like the format as well. Since we wanted to show you the VB Team's favorite Orcas features, I think this was the best medium to show it so you could see all the code. I'll be posting more so stay tuned. I am new to channel9, so greetings to you all! This is the first video I have watched on here, great stuff! Look forward to working with and contributing to this forum some more! Nicely done! Amanda is a very good presenter. The video is well-paced and engaging. I really like the format that puts the VS2008 environment foremost and the people as picture-in-picture. This is the first kind of the webcast that i've ever seen. Code at the back ground and live on a small window, awesome... i'm spell bound in the first time when i saw the window resized to the right corner. The idea is outstanding. The entire show is worth of ton thanks..
clap .. clap .. clap .. Does anyone else have the same problem as I do when watching this video. Namely the code screen is blurred, so much so that the text is unreadable. When the camera shot is away frm the code screen the video is fine.